Technical innovation thrives on the knowhow of the user. As part of the PERI Academy activities, we therefore help our customers to become familiar with the optimal use of our system equipment and latest technologies. 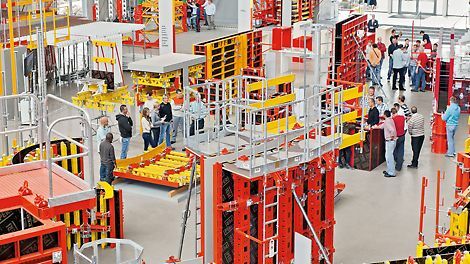 In concrete terms this means: we organize seminars, workshops and product training courses in which we pass on specialist knowledge and provide practice oriented training. In so doing, we support the users to efficiently implement PERI solutions on the construction site even when under time pressure. The programme is specially tailored to the individual tasks of the specialized personnel and managers in work preparation, site management, calculations and costings as well as the foremen, scaffolders and other craftsmen. Thereby, PERI specialists along with external experts explain current regulations, standards and current industry issues in great detail. This is our contribution regarding the exchange of important knowledge and experience for all those parties interested in formwork and scaffolding technology. And it corresponds to our understanding of real added value for our customers.